The Oakland processing facility of the U.S. Postal Service has a roof-mount PV system using PowerLight's PowerGuard interlocking solar roof tiles. The 75,000 square foot system, roughly the size of two football fields, will produce about 910 kW. A recently completed project at a U.S. Postal Service facility in California features the largest photovoltaic installation on a non-military government building in the entire country--but it is just part of a broader effort by the Postal Service to be more energy efficient. The U.S. 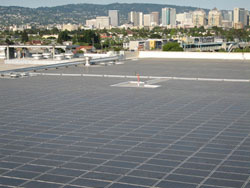 Postal Service (USPS) Processing and Distribution Center in Oakland, California, features the country's largest photovoltaic installation on a non-military, government building. But the facility represents more than just boasting rights. It is part of a much larger project designed to make the Pacific Area of the USPS more energy efficient at no additional cost. "We're really thinking there's a competitive advantage to being considered greener," says Ray Levinson, environmental manager for the USPS Pacific Area. "Environmentally speaking, people tend to think of the postal service negatively because of the mail that can end up in landfills and the billions of miles we drive to deliver it. "We now have competition from other providers, such as FedEx and UPS, and this is our way of being innovative. It really doesn't cost us anything--the energy efficiency projects use the same dollars that we would have paid to Pacific Gas & Electric over time, had we not implemented them." Of the 2,000 USPS buildings within the Pacific Area, which consists of California and Hawaii, only 65 buildings are larger than 50,000 square feet. Yet those sites use 50 percent to 70 percent of the hundreds of millions of kilowatt-hours that the Pacific Area consumes annually. Processing facilities, which operate round the clock sorting mail and packages, account for 35 of those buildings. Because of their large energy draw, the Postal Service decided to focus on these buildings for energy efficiency projects. So far, retrofits of postal processing facilities in Hawaii and California have involved installing nearly two megawatts of solar panels as well as new heating and air conditioning systems, new lighting technology and motion-sensors to turn off the lights when workers aren't present. The Oakland facility features 910 kW of PV panels, the largest of any postal processing center. Levinson is also quick to point out that the Oakland USPS facility is rated 6 kW higher than the nearby FedEx sorting facility's 904 kW. The Postal Service's quest for energy efficiency began in the late 1980s, but funding for capital projects dried up in the mid-1990s, Levinson says. When the Postal Service was created from the old U.S. Post Office Department in 1971, it no longer received Congressional appropriations like other governmental agencies. Instead, it had to fund projects strictly through revenue from postage and other services. Unlike other federal agencies, the Postal Service has greater flexibility when issuing contracts since it can receive funding--such as rebates--from electricity providers. But it cannot earn tax credits like private companies. The Pacific Area has taken the lead on energy efficiency improvements, Levinson says. The Oakland retrofit also included changing lighting from high pressure sodium lamps to more energy efficient high-output T8 lamps and occupancy sensors. "The energy crisis and the availability of generous rebates really made it easier for us to be successful implementing projects here, more so than in the other postal areas where energy may be cheaper and there are no rebates," he says. "Being in California made it easy for me to get a lot of work done. With the rotating blackouts, there's a lot of awareness and a lot of support from the local utilities and public agencies such as the California Energy Commission." Levinson developed and awarded two competitively bid contracts in late 2002--one for Southern California improvements and one for Northern California. Any energy efficiency project undertaken had to show a payback of 10 years or less. Chevron Energy Solutions of San Ramon, California, a wholly owned subsidiary of Chevron Corporation, received the contract for Northern California and Honeywell Building Solutions of Minneapolis received the contract for Southern California. Chevron Energy Solutions doesn't manufacture any products, says John Gajan, Chevron manager of the postal service projects. Instead, it provides engineering, design and analysis, and acts as a project manager to secure and oversee contractors. "We're not trying to push any type of technology," Gajan says. "We just find the right solution to meet the customer's requirements and needs. We bring it all together and provide the integration, management and administrative glue for a project." Previous to these contracts, the USPS had completed hundreds of building retrofits, but most involved relatively simple items, such as switching to more energy efficient lighting, Levinson says. The more recent contracts involved sophisticated combinations of fuel cells, cogeneration and PV panels. So he enlisted the help of experts at Lawrence Berkeley National Laboratories in Berkeley, California--through the Federal Energy Management Program (FEMP)--to analyze the proposals before work was approved and construction began. "FEMP really ensured our success," he says. "They're really knowledgeable about what's out there. FEMP helped us find a lot of the rebates, and we couldn't have done the renewables and other distributed generation projects without the rebates." The Oakland processing facility was part of a third series of contracts, amounting to about $18 million, awarded to Chevron Energy Solutions. Also involved were sorting facilities in Berkeley, San Leandro and Livermore, California. Chevron Energy Solutions had already completed improvements at eight other processing facilities in the Sacramento, California, area and two in San Francisco, Gajan says. The Chevron team spent six to eight months conducting energy audits and analysis and engineering plans before it received construction authorization for the Oakland facility. "We are always bringing a broad array of technological options for consideration," Gajan says. In the case of solar, Chevron officials consider the overall size of the installation, its structure and the space available. "How does the roof look?" Gajan says, referring to the questions they consider. "How much roof is available? Is it a 'clean' roof with unobstructed surface area? Are there parking areas? In this way, the individual project is tailored to the needs of the facility." At the West Sacramento sorting facility, for example, Chevron recommended a 403-kw peak PV system mounted on parking shade structures using Richmond, California-based PowerLight's Parking System. But at the Oakland facility, Gajan says the clean roof lent itself to a roof-mount system using PowerLight's PowerGuard interlocking solar roof tiles. The 75,000-square-foot system, roughly the size of two U.S. football fields, will produce about 910 kW. Since the roof had been overbuilt originally, Gajan says no structural reinforcement was needed to accommodate the additional weight of the solar panels. The Oakland retrofit also included changing lighting from high-pressure sodium lamps to more energy efficient high-output T8 lamps and occupancy sensors. "Generally we look at lighting and try to improve energy efficiency and reduce the amount of electricity," Gajan says. "But we also improve the quality of the lighting. We converted the work floor from a high-intensity HID-type of fixture to florescent that gives a white light. It's more eye friendly." 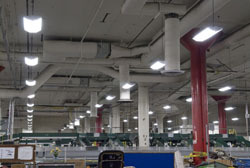 Other energy upgrades included light-emitting diode exit signs; three 300-ton centrifugal chillers that eliminate ozone-depleting chlorofluorocarbon refrigerants from the facility; other heating, ventilation and air conditioning systems; a new energy management system to control HVAC equipment; high-efficiency air compressors; and water conservation measures. From the time Chevron received the contract, Gajan says it took about two years to complete the Oakland facility. As well as the installation of solar panels, U.S. Postal Service energy efficiency retrofits have also involved new heating and air conditioning systems. Actual construction lasted about a year, partly because crews had to make improvements to a sprawling facility built in 1969, and with round-the-clock operations. The nearly one-million-square-foot building houses about 2,500 employees who handle more than 8.7 million pieces of mail daily. "With this facility in particular, there was a lot of coordination because they were operating 24/7, 365 days a year, so we always had to coordinate around people and the processing that was going on during construction," Gajan says. Levinson says the contract stated that no work interruptions could occur. In fact, construction work had to stop between Thanksgiving and Christmas, the Postal Service's busy season. "Lucky for us, the majority of mail processing goes on during the night, and most of the project work was generally during the day," Levinson says. The project was completed in November 2006. Altogether, the rooftop solar array and the other improvements are expected to lower the facility's electricity use by 11 million kWh and cut power purchases from Pacific Gas & Electric (PG & E) by one-third. Annual electricity savings is expected to be more than $1 million, and Levinson says that's a conservative estimate. That's equivalent to about 2.6 million 39-cent postage stamps. "We didn't even figure in the escalating cost of energy over those 10 years," he adds. Not only does the Postal Service talk about how the projects will save energy and money, but Levinson also says the USPS has now begun to think about the reductions in greenhouse gases that will be achieved with the project. In the case of the Oakland facility, the solar panels will help the Postal Service cut carbon dioxide emissions by 7,400 tons annually, which is equivalent to the carbon dioxide that would be absorbed by 2,000 acres of trees. 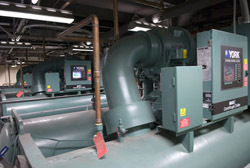 The four installations within Chevron's most recent contract cost about $18 million and are funded primarily by $10.1 million in energy savings, $4.5 million from the USPS's CFC refrigerant replacement program and $3.4 million from PG & E. Improvements to the Oakland facility alone cost about $6.2 million, and the USPS received $2.6 million in rebates from PG & E's Self-Generation Incentive Program. The upgrades will also ensure that the USPS meets the 2005 Energy Policy Act, which requires federal facilities to reduce energy consumption by two percent per year for the next 10 years. Upgrades to other facilities within the Pacific Area have been temporarily stopped until an internal reorganization can be completed, Levinson says. However, some projects, such as the San Jose processing facility and the San Mateo server farm that were already in the pipeline, will be completed. The San Jose project is what Levinson calls mid-size and involves about a 400-kW PV system as well as lighting and HVAC upgrades. Due to the large number of computers they house, server farms tend to use 10 times as much electricity per square foot as mail processing centers, Levinson says. With the help of Lawrence Berkeley National Lab experts, he says they've learned that new cooling techniques will allow them to increase temperatures by a couple of degrees without affecting computer operations.